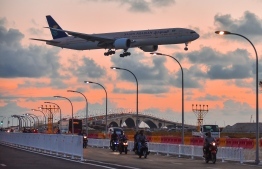 Vehicles travelling to Velana International Airport via Sinamale Bridge have now been given direct access to enter the airport. Prior to this, only vehicles authorised by Maldives Airport Company Limited (MACL) were allowed to enter the airport. According to the rules and regulations recently made public by MACL, there are four main areas made available for vehicles entering VIA. This includes an area for the parking of personal vehicles, an area for buses, taxis and personal vehicles of passengers going to the airport for departure, an area for personal vehicles and taxis carrying passengers from arrival, as well as an area for buses carrying passengers from arrival. Furthermore, an area in front of the departure gate is designated for passengers travelling to the airport. However, personal vehicles and taxis carrying passengers are designated to make stops only for the purpose of unloading luggage. No vehicles are allowed to park outside of designated areas. The reclaimed lagoon adjacent to the new terminal at VIA is specially allocated for the parking of vehicles travelling into the airport and check posts have been made to collect fees from all vehicles. Additional MVR 30 will be charged per hour exceeding the given time. Additional MVR 10 will be charged per hour exceeding the given time.